Why Use QuickBooks Online Integration? Using the QuickBooks Online integration will allow you to seamlessly transfer company and project information from Cloud to QuickBooks Online. Ultimately, we want you to be able to push over anything accounting related to your accounting software so you can use D-Tools Cloud for sales and project management, and your accounting software for accounting. Connecting to QuickBooks is easy. 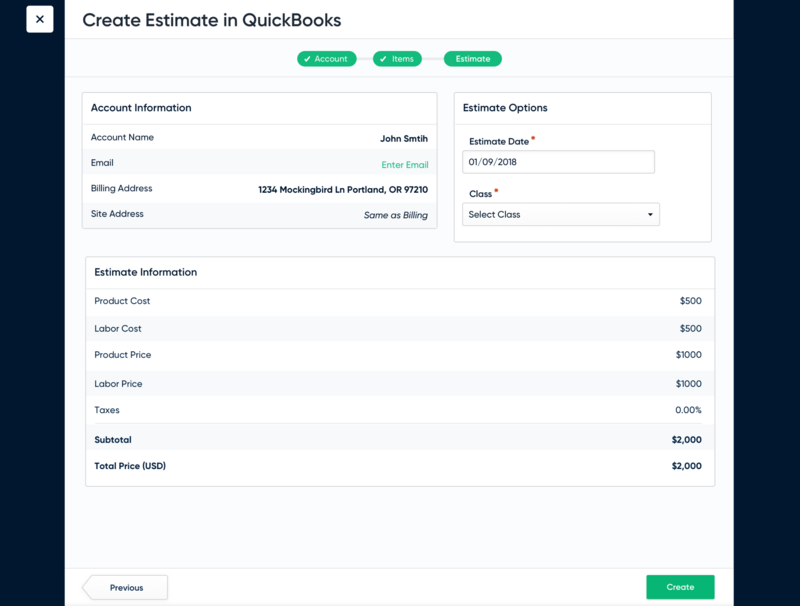 All you have to do is enter your QuickBooks Credentials, Authorize D-Tools to push to QBO, and Connect! Step 2: Enter your QuickBooks credentials to log into QuickBooks. Don't worry, D-Tools doesn't see your password. Step 4: You are connected! Note: Everything below this point will be hidden, unless you are connected to QuickBooks Online. Once an Opportunity is won, it is automatically turned into a project. 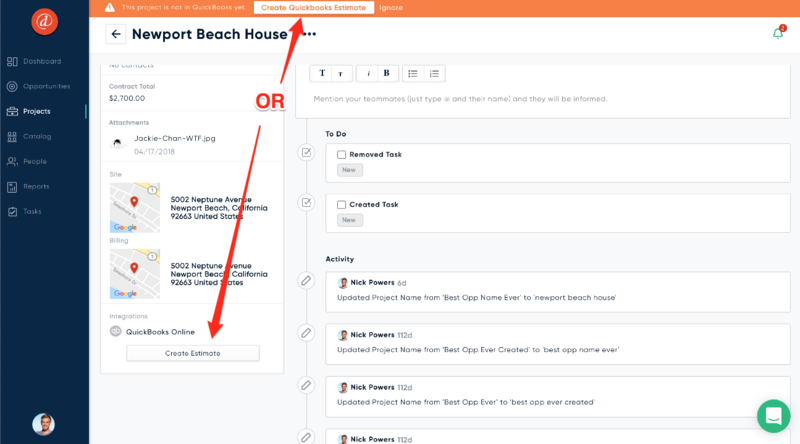 As an accounting role, you will see an orange banner that alerts you that your project is not pushed to QuickBooks. 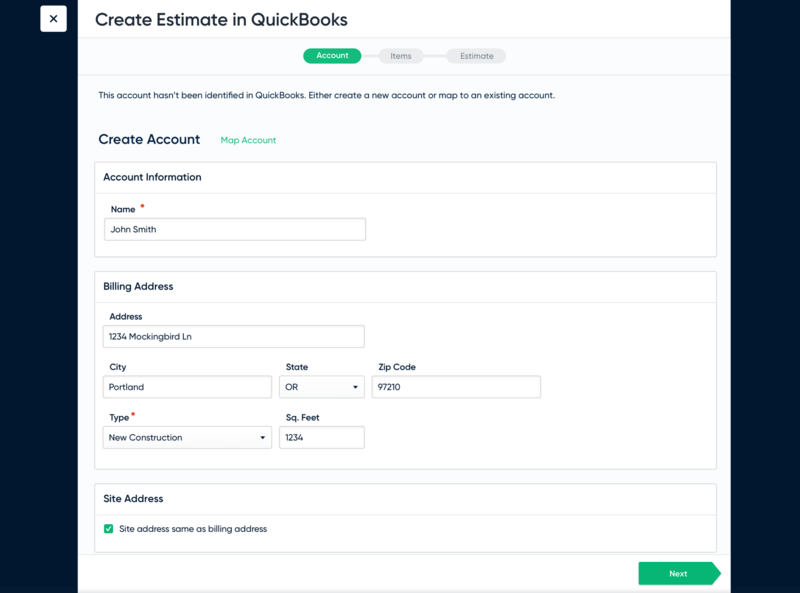 You can quickly push this to QBO by clicking Create QuickBooks Estimate button. You can also click the Link to QuickBooks button in the integrations section on the project page. These buttons will only show if you are connected to QuickBooks. There are 3 steps to creating an estimate in QuickBooks: Account, Items, and Review. The account step will ask you to Create or Map to an existing account in QuickBooks. This is just to send over the accounting information entered in D-Tools that will be valuable to have in QBO. If an account is already sync'd, then you will automatically be taken to the items part since the account already exists. You will have the opportunity to review before you submit the estimate, and can always edit the account by hitting the previous button to go back to the account. See below for syncing all accounts to QuickBooks. To create an account, just fill in as much of the fields as possible. If you think you have the account created already, but just not in D-Tools, then you can search for accounts in QB by going to the Map Account. If you see the account you are looking for, select and click next. If not, create the account. 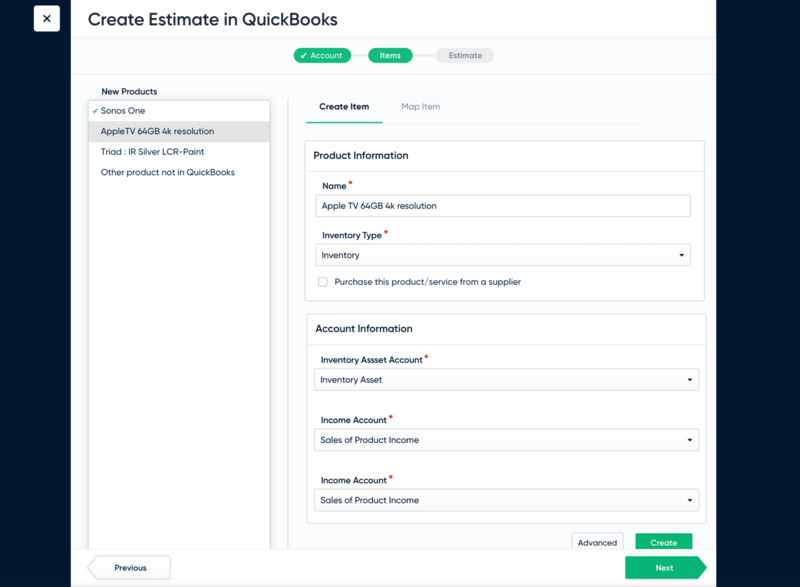 When creating an estimate to send to QuickBooks, QuickBooks requires existing products. You will see a list of products on the left side that are not sync'd to products in QuickBooks. Go through each product and enter the Product and Account Information for each. You can also select multiple at once by using shift + click and command + click. Once you have created the Account and Items in QuickBooks, you will review the Estimate. Here you can add some information like date, class, group, and email. You can also review information for the Account and Estimate. When you are done reviewing, create the estimate and it will be created and sent to QuickBooks. You will see a estimate number that you can use to track back to QuickBooks Online. To send D-Tools accounts in QuickBooks Online without having to create an estimate, you can select all the people or accounts you want to send over, or you can select all people. Then click the export icon in the upper right and select "Export to QuickBooks Online". As of now, things can only be pushed to QuickBooks. Nothing will be sync'ed, so you will need to re-push to QuickBooks when changes are made. You can do so by exporting the item again. You can send products to QuickBooks by selecting the products you want to send in the catalog. Click the export button and export to QuickBooks. Changes will have to be pushed whenever a change is made. This will automatically ask you when you create an estimate. Does D-Tools work with QuickBooks Desktop or only Online? FAQ: Can D-Tools affect my accounting software?